AUSTIN - Texas Land Commissioner Jerry Patterson applauded the Texas Federation of Republican Women (TFRW) for issuing a policy statement which calls upon the federal government to reform our nation's current immigration system. "I am grateful to the TFRW and its leadership for taking a strong stand in favor of immigration reform," said Commissioner Patterson. "Their statement is a strong call to action to our federal lawmakers, and I could not be more pleased at the way in which President Carolyn Hodges and this organization have stepped up to help lead on the issue." 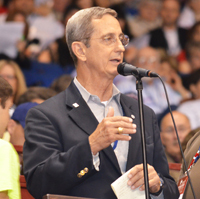 "TFRW's statement echoes the sentiments that I offered on behalf of the "Texas Solution" at the 2012 Texas GOP State Convention where I was the lone statewide elected official to speak from the microphone in favor of immigration reform. Like the overwhelming majority of delegates at that convention who voted to adopt this platform plank by a 3 to 1 margin, I believe that there are fair, respectful and conservative solutions to these challenges. Texas Republicans are serious about doing something that works and the statement from TFRW reinforces that Texas Republicans will remain at the forefront of this policy discussion. I look forward to working with TFRW and its 11,000 members to continue to present workable immigration solutions to our lawmakers."